I’m going to write about this at the risk of losing my reputation for eating great food… My friend Matt made a statement that he has never eaten a Big Mac or a Whopper. I responded by saying I had also never eaten either of these burgers from the fast food giants, and then I jokingly said we should perform a taste test… and he and some other friends thought that was a great idea. So I went along with it, not entirely all gung-ho about it. Actually, I was a little nervous about the whole thing. I hadn’t eaten a burger from a fast food joint in a looooong time. Like, not since I was little, and even then I think I always opted for the chicken nuggets. I am really not a big fan of fast food. I have been seeing McDonald’s a lot in the news lately for adding apple slices to their happy meals. I’m not really sure that is going to make a difference because I think they probably have to coat the apples with preservatives or something to keep them from turning brown, but at least it’s a step in the right direction. Here’s how the taste test went…. Our friend James decided to come along because he has never eaten the Big Mac, even though he is the fast food king of all of my friends. We also decided to order both burgers the “original” way, so no extra add-ons were part of the taste test. Matt, James, and I went to Burger King first, with a coupon for buy-one-get-one-free Whoppers. I was happy about that because I did not want to spend a bunch of money on this. We ordered and picked up our Whoppers and walked across the parking lot to McDonald’s (yes, there is just one small parking lot separating McDonald’s and Burger King). Is it okay to walk into McDonald’s holding a Burger King bag? Probably not, but we didn’t care. We also had a coupon for a free Big Mac (score!) and we got some fries and drinks to wash it all down… just in case it was gross (I’m glad we got the fries). We also prepared ourselves with about six of those little cups of ketchup, another good idea. We sat down and cut the Whopper and Big Mac in half – Matt and I shared them because there is no way I would eat two burgers. James was the lucky (or unlucky) one with two whole burgers to himself. We started with the Whopper. 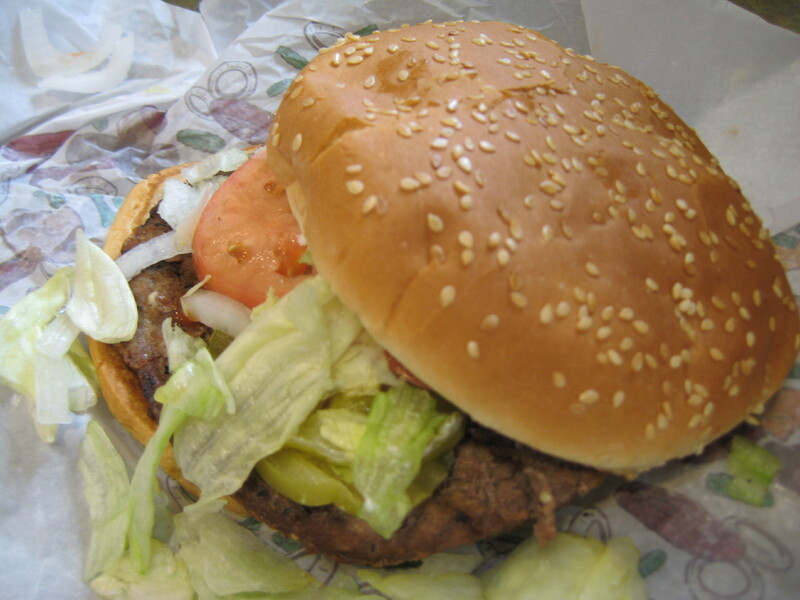 The Whopper has a whopping 670 calories attached to it. It looked much different from the Big Mac. The bun was giant sized and the meat patty matched it. The meat was big, round, flat, and dry. 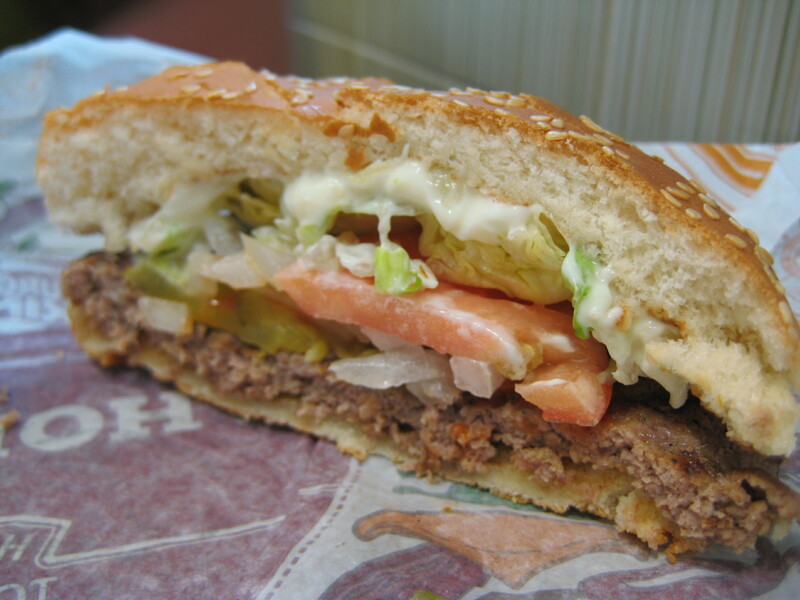 The topping included mushy pickles, shredded iceburg lettuce, crappy tomatoes, cut up onions, mustard, ketchup, and mayo. I think we should have added cheese to it, it might have helped it a little bit. I really don’t like mayonnaise, but I didn’t want to mess up the taste test. Impression at first bite… dry and boring. I added extra ketchup which did not help. 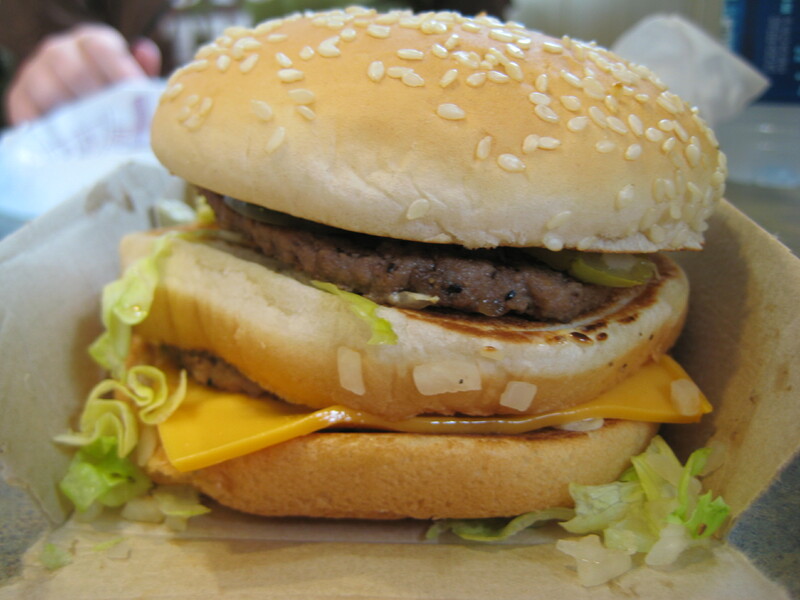 The Big Mac is much smaller around but is actually taller than the Whopper. It’s not too far behind the Whopper with 540 calories. The most notable difference is that it has three buns, cheese, and a special sauce (which I think might just be Russian dressing). The meat was not as dry. It was actually kind of greasy. It also included the pickles (a little crunchier than the Whopper’s), shredded iceburg lettuce, and onion but no tomatoes or other condiments. I think this burger is supposed to be all about the special sauce. Impression at first bite… not as dry, not as boring. The special sauce did give it an edge over the Whopper but I still didn’t really like it that much. It’s not something I would eat again, but if I had to choose between the two, the Big Mac would win. I was happy about having the fries and ketchup. 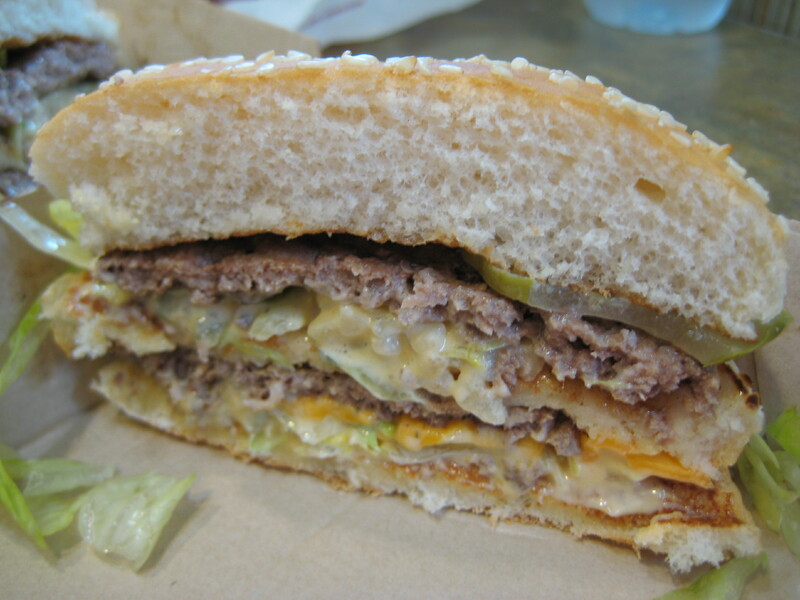 I finished the half of the Big Mac but not the half of the Whopper, it was just straight up bad. 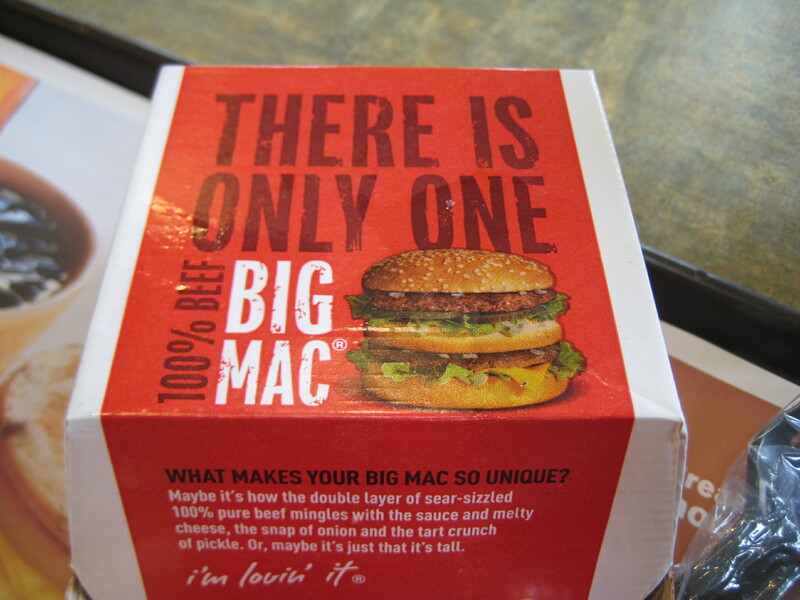 Matt agreed with me on choosing the Big Mac as the better of the two. James disagreed and choose the Whopper because he didn’t like McDonald’s special sauce. Two to one, the Big Mac wins. Overall experience… I had fun, but it is not something I want to do again. I felt kind of gross afterward with the weird feeling you get after you eat Chinese food. You know the feeling… like you’re hungry but you know you just ate a lot. Why does that happen? We noticed both buns had marks on the inside like they were toasted… but they were not toasted. What do they do print marks on the bun? I find that very odd. How can you even do that? One last thing, not to be completely disgusting, but I also couldn’t get the image of large scale cattle farming out of my head. Which is one reason I only by the free-range, grass-feed beef at market.